WindQuest’s Interior Layout. 85ft Length 41ft Width. 3,400 SqFt Living Space. 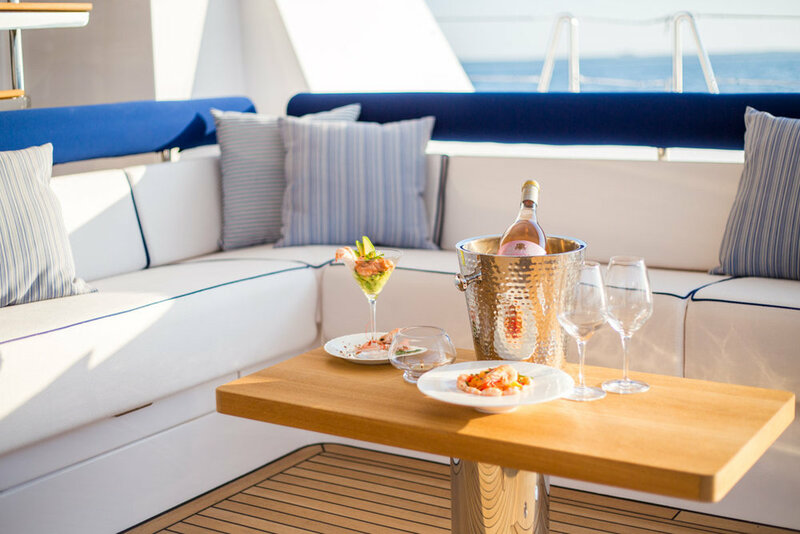 Relax and stretch out on the aft deck taking in panoramic views while staying in the cool of the shade or head up to the flybridge to soak up the sun. Or why not step out onto our trampolines to feel the breeze beneath you or just while away the day under foredeck awning. WindQuest’s spacious interior and easy flow make you feel at home from the first step inside. Bright woods, comfortable seating and tasteful touches around the interior adds an air of sophistication that you can see and feel. ...and is always hunting for new locations that offer exciting places to explore. Over the last four years our itinerary has included Vancouver Canada, San Fransisco, Cabo San Lucas, Panama City, Havana, New York, Camden, Portland ME, London, Glasgow, Lisbon, Azores and pretty much everywhere in between! This summer WindQuest enjoyed exploring the Baltic Sea, heading as far as Stavanger, Hamburg, Stockholm, Copenhagen and St. Petersburg. With the start of the new year WindQuest feels the privilege of welcoming back some return clients and some new faces. Getting to enjoy some of her favorite stomping grounds WindQuest's crew are excited to try some new locations suggested to us by locals in the know. Stay tuned to our FaceBook and Instagram feeds to see what they uncover. With the charter season completed WindQuest will begin her next quest; to cross the Atlantic and head to Gibraltar to commence her journey into the Mediterranean Sea. Her present itinerary includes Spain, Italy, Croatia, Greece and then finally Tel Aviv, Israel. A truly unique summer itinerary awaits WindQuest. Getting to explore, taste and become absorbed in fascinating area of the world rich in culture. After 5 years of planning, improving and pushing bold design ideas, WindQuest was born. Being launched in 2014 she instantly set a new standard in catamarans. WindQuest was born out of the desire to have a state of the art performance catamaran with the luxury and class of a five star hotel. Back in 2009, the owner had the idea to create a bold new catamaran using world renowned yacht designer Marc Lombard. The owner and his crew had been so impressed by the performance and superior design touches that Marc had created on other yachts they had used. After many discussions with Marc aboard on of his finest catamaran creations, Matau, we had the specs we wanted for the ultimate yacht. She had to be 85ft long, made of aluminum, have an impeccable interior and sail like a bat outta hell. This may sound like a simple set of specifications, but implementing them would be a whole other challenge. Marc and his team didn't disappoint. As the designs were unfolded on the table a hush came over the eager crowd. Hungry eyes consumed the drawings being sated with every inch of the pages. From her unique raked back bows and commandingly high freeboard we could see she was going to have a look of speed even when she is sitting at a dock. Coupled with a towering mast we knew we would have the performance to put a smile on any thrill seeking sailors face. The immediate feeling of space was apparent as the designs began to unveil her interior. A wide and tall salon is etched on our minds. Passageways adventured off left and right with the unmistakeable door way ahead to something truly special. Marc and his team had prepared a dynamic, modern salon with excellent entertaining touches. A large bar, formal and casual seating, impressive entertainment capabilities and vast headroom makes for tasty viewing. We continued on into each room on the yacht and took the time to examine and re-examine each room’s role and in essence, each room’s soul. Before we knew it we were agreed and off and running. Hulls had ben hewn from vast sheets of aluminum and welded with laser precision before being flipped 180º to then accept her composite coachhouse and flybridge. A marriage of hull to deck. Material choices, sailing package, equipment and furnishing were finalized and secured. We were one our way to a first of her kind catamaran. An orchestrated masterpiece was being conducted by JFA Shipyard in Concarneau France. Frédéric Jaouen leads his skilled team with Michel Siou acting as his first mate in charge of the build. The attention to detail is always evident. Stainless steel work is seamless giving each section a true feel of originality and hand craftsmanship. The hulls are painted a metallic gray hue that catches the eye like a fine suit. A tall carbon fiber mast inspires confidence and proportion. All aspects are approached with a view to quality and longevity. As soon as WindQuest was completed she set a new bar in custom made catamarans and heralded the beginning of a legacy that will continue for many years to come.